Bruce Willis re-teams with 'Sixth Sense' writer-director M.
Night Shyamalan for this tense, atmospheric thriller. David Dunn (Willis) is the sole survivor of one of the worst train crashes in US history. 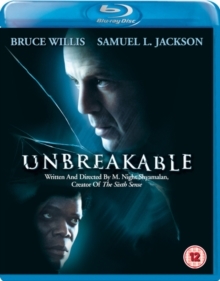 Walking away without a scratch on him, Dunn is unable to explain why he should have been spared; but then, when he meets the mysterious Elijah Price (Samuel L.
Jackson), he is encouraged to begin asking himself important questions. Why has he never fallen sick? Why has he never been injured? What purpose could there be to his special gifts?